What causes someone to develop a specific phobia? Specific fears do not all develop around the same age; some fears develop around the age of 4 years (fear of ghosts), others develop later in life (fear of blood and injury). In the majority of people, these fears disappear over time. In some cases, however, these specific fears develop into specific phobias . One of the specific phobia causes seems to be inheritance: specific phobias run in the family ,,. Other specific phobia causes could be environmental: parenting and life events. This page focuses on the most researched specific phobia causes and explains how and why someone develops a specific phobia and others don’t. How do individual phobia stimuli add to the development of a specific phobia? Do the teeth of a dog or the length of a needle always add to the phobic fear? Online treatment for specific phobia. At Barends Psychology Practice, we offer (online) counseling for specific phobias. Contact us to schedule a first, free of charge, online session. (Depending on your health insurance, treatment may be reimbursed). Specific phobias run in the family. If your mother, father, sibling or to a lesser extend grandmother or grandfather has a specific phobia, then there is a higher chance that you may develop a specific phobia at one point in your life. Research shows that fear and specific phobias are moderately inheritable ,,,. There are different inheritance estimates for the specific phobia subtypes: Animal phobias 32%, Blood-Injury-Injection phobias 33%, and Situational phobias 25% . This is in line with the inheritance estimates of dental fear of 30% . What does this mean? This means that 32% of the factors that contribute to the development of animal phobia can be explained by genetics. The other 68% of the factors that contribute to the development of an animal phobia can be explained by environmental factors. Interestingly, recent research suggests that there is a large group of genes that all contribute a little bit to the development of anxiety disorder (phobias belong to this category) . This may explain why a fear of heights in person A is much more severe compared to the fear of heights in person B; person A may possess more genes that contribute to the development of anxiety. Genes can be found on chromosomes. A chromosome carries part of the genetic material of an organism (a human being is an organism). Research shows that chromosome 14, which contains 3 to 3.5% of the total DNA in cells, seems to be linked to the development of a simple phobia . In other words: one of the specific phobia causes is genetics. Someone has a higher chance of developing a specific phobia if this person has a direct relative with a specific phobia, but it does not mean that this person will develop a specific phobia. After all, only a small percentage of the factors contributing to the development of specific phobias can be explained by genetics. The majority of factors contributing to the development of specific phobias are determined by environment: parenting and life events ,. In this section the role of environmental factors on the development of specific phobias is being discussed. Please note that being exposed to certain environmental factors does not mean that you will develop a specific phobia. It only increases the chance of developing a specific phobia if you are prone to developing specific phobias/anxiety disorder and/or if the response of significant others (parents, siblings, teachers) to specific animals, objects or situations is exaggerated. Specific fears and specific phobias are common in children; 4-6 year olds: 71.0%, 7-9 year olds: 87.0%, 10-12 year olds: 67,8% . The development of fears in children seems to grow rapidly as children learn to infer physical cause-effect relationships and increasingly anticipate potential negative outcomes . Over time their fears shift from fear of strangers (baby’s), to a fear of magical creatures and animals (toddlers) and later to a fear of social situations, blood and injury, and natural disasters  and eventually subsides or disappears. Children who have direct relatives with specific phobias have a higher chance of responding stronger to fearful stimuli, which increases the chance of developing a specific phobia. The responses of parents, siblings or teachers to phobic stimuli (animals, objects or situations) can also affect the development of specific phobias in children . Parenting styles can have a significant effect on the development of specific phobias in children . Parental overprotection and control, for instance, increases anxiety levels and chances of developing anxiety disorders (including specific phobias) in children ,,,. 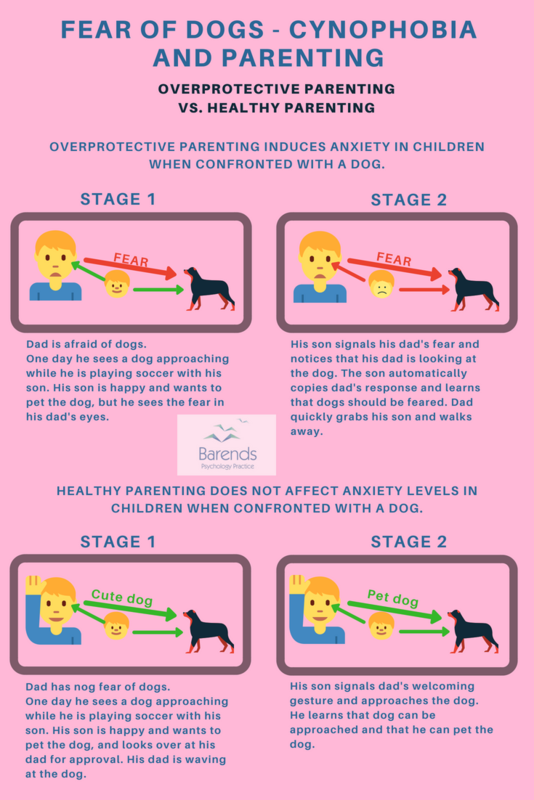 Most studies suggest that mother’s overprotectiveness has a stronger effect on children’s anxiety (compared to father’s overprotectiveness), but it is more likely that it depends on the parent the child is attached to the most. The development of children is strongly dependent on the way their parents raise them. Parents who are overprotective teach their children that the world is an unsafe place and that there is a high risk to getting hurt or injured. They more often exaggerate the negative consequences of risky behaviour, which induces fear in children. Anxious people, compared to non anxious people, more often refrain from taking risks, which reduces the chance of getting hurt, but also denies them the chance of experiencing that nothing bad will happen. For instance, climbing a ladder is not dangerous at all, but children can get scared when someone keeps reminding them of all the risks. This creates fear in children and eventually increases the chance of making mistakes. In other words, one of the specific phobia causes is being overprotective and controlling as parents. 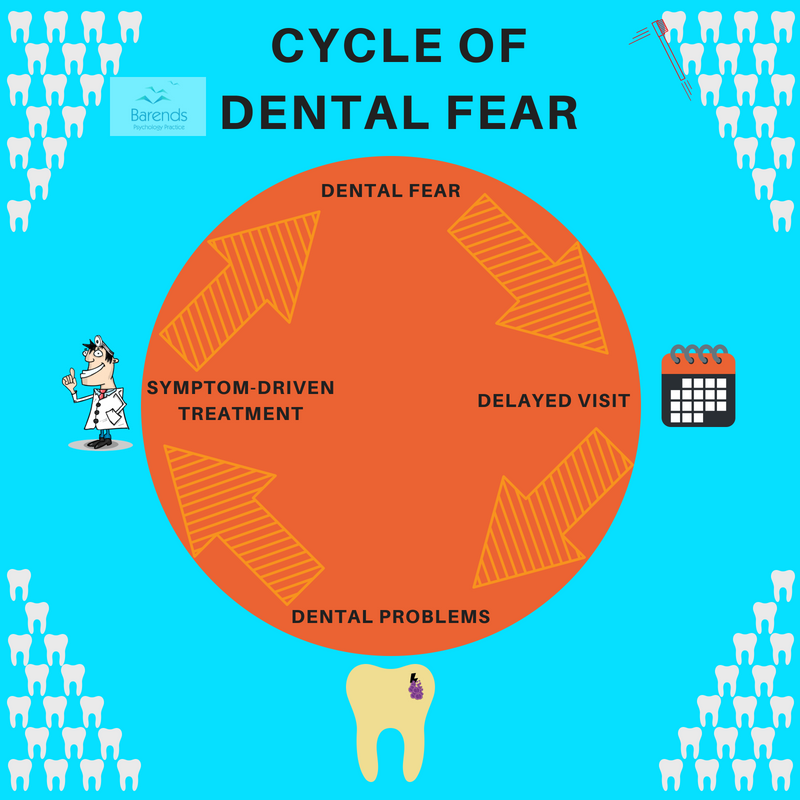 Major life events or traumatic experiences not only play a role in the development of post-traumatic stress disorder, but also in the development of specific phobia, such as dental phobia ,. Almost 75% of people with high dental fear experienced a traumatic event in the past. Violent crimes, dental trauma and medical traumas were the most commonly reported traumatic experiences . Also, violence between parents and verbal aggression is a predictor of specific phobias in children . Van Houtem, C. M. H. H., Laine, M. L., Boomsma, D. I., Ligthart, L., Van Wijk, A. J., & De Jongh, A. (2013). A review and meta-analysis of the heritability of specific phobia subtypes and corresponding fears. Journal of Anxiety Disorders, 27, 379-388. Randall, C. L., Shaffer, J. R., McNeil, D. W., Crout, R. J., Weyant, R. J., & Marazita, M. L. (2017). Toward a genetic understanding of dental fear: evidence of heritability. Community dentistry and oral epidemiology, 45, 66-73. Fears, N. (2001). The etiology of childhood specific phobia: A multifactorial model. The developmental psychopathology of anxiety, 355. Muris, P., Merckelbach, H., Gadet, B., & Moulaert, V. (2000). Fears, worries, and scary dreams in 4-to 12-year-old children: Their content, developmental pattern, and origins. Journal of clinical child psychology, 29, 43-52. Shimada‐Sugimoto, M., Otowa, T., & Hettema, J. M. (2015). Genetics of anxiety disorders: genetic epidemiological and molecular studies in humans. Psychiatry and clinical neurosciences, 69, 388-401. Loken, E. K., Hettema, J. M., Aggen, S. H., & Kendler, K. S. (2014). The structure of genetic and environmental risk factors for fears and phobias. Psychological medicine, 44, 2375-2384. Heider, D., Matschinger, H., Bernert, S., Alonso, J., Brugha, T. S., Bruffaerts, R., … & ESEMeD/MHEDEA 2000 Investigators. (2008). Adverse parenting as a risk factor in the occurrence of anxiety disorders. Social psychiatry and psychiatric epidemiology, 43, 266-272. Lieb, R., Wittchen, H. U., Höfler, M., Fuetsch, M., Stein, M. B., & Merikangas, K. R. (2000). Parental psychopathology, parenting styles, and the risk of social phobia in offspring: a prospective-longitudinal community study. Archives of general psychiatry, 57, 859-866. Pereira, A. I., Barros, L., Mendonça, D., & Muris, P. (2014). The relationships among parental anxiety, parenting, and children’s anxiety: The mediating effects of children’s cognitive vulnerabilities. Journal of Child and Family Studies, 23, 399-409. Wei, C., & Kendall, P. C. (2014). Child perceived parenting behavior: Childhood anxiety and related symptoms. Child & family behavior therapy, 36, 1-18. De Jongh, A., Fransen, J., Oosterink‐Wubbe, F., & Aartman, I. (2006). Psychological trauma exposure and trauma symptoms among individuals with high and low levels of dental anxiety. European journal of oral sciences, 114, 286-292. Magee, W. J. (1999). Effects of negative life experiences on phobia onset. Social psychiatry and psychiatric epidemiology, 34, 343-351.